CAC AmeriCorps is committed to changing people’s lives through environmental service, embodying the spirit of hope, improving communities and making East Tennessee a better, more sustainable, place to live. We care about the entire community, and we are dedicated to helping people help themselves and each other. CAC AmeriCorps is an AmeriCorps National Service program as well as a program of the Knoxville – Knox County Community Action Committee (CAC), a community action agency that has served the needs of low-income and other at risk populations in the region since 1964. CAC AmeriCorps leverages the skills, passions and ideals of the youth of our great nation in addressing pressing local environmental issues and interconnected social needs in Knoxville and surrounding areas. This is accomplished through empowering each member to use their hands, heart and mind to build capacity in our partner organizations and uplift the community both through traditional conservation practice as well as professional technical application. 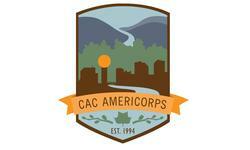 CAC AmeriCorps has been in operation since 1994 and is the longest running environmental service corps in the State of Tennessee. We are a proud member of the Corps Network and a 21st Century Conservation Service Corps. Our program works to directly impact the people and community through environmental service, disaster response and capacity building operations for community partners.